That’s right. It’s totally FREE, so grab it while you can. So let’s get right to it and start getting your nutrition on point. You’re gonna have to put in a bit of work here, there’s no getting away from it. But it’ll be totally worth it. Trust me. There’s not one single person that looks back on a successful fitness transformation and says, “that hard work wasn’t worth it”. Not one! Changing your food habits for the better is a journey. How quickly you can progress to the end destination is all based on your starting point. Let me explain what I mean by that. When I take on a new client, I don’t always start with calories and macro calculations (we’ll get on to that in step 3 & 4). Let’s say, for example, you come to me and say, “Simon. I’ve never been to the gym and I eat sh*t food all day long. But I want to make a change. Where do I start?” In this situation it would be a bad move to move straight to talk of macros and meal plans. Why’s that? Well, simply because it would be too many changes in one go. I’d have to overhaul not just the foods you eat, but your whole attitude, perception, and approach to food. And I’d have to do that overnight! It’s just too much for the average person to effectively cope with. Sure, you may last a week by jumping straight to a meal plan, or maybe slightly longer is you’re particularly persistent, but experience tells me it won’t last. What needs to happen is a slower process of change that introduces new concepts and dietary improvements gradually. The first step is to switch out all those processed foods for real food. Fresh meat. Fresh vegetables. Good sources of protein, fat, and carbohydrates. Take this approach to every meal and you’ll be created a foundation and platform that can be used to make long-term change a reality. 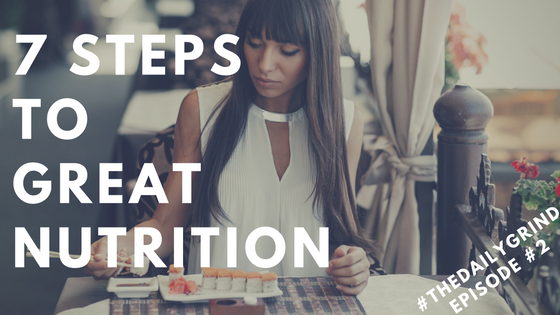 To help this process along, start by following this simple measuring approach to your meals. There’s no maths involved and it can be done without scales. Whether you’re eating at home or eating out, it’s a great technique to use to manage portion control. I even use it myself when I’m out and about and haven’t got access to my regular foods. For the ladies out there, you just need to half the portions sizes below. If you’ve read some of my previous blogs you’ll know that I bang on a lot about the benefits of water as a basis for good nutrition. So if you’ve heard this bit before then it’s worth reminding you because it’s THAT important! The takeaway you need from this step is that you should drink enough water so that your pee is clear. You can get a lot more scientific about it and calculate exactly how much you need on a daily basis, but I’m going to assume you actually have a life and would prefer to live it rather than waste it calculating water intake down to the last droplet. For most people that’ll be around 2-3 litres per day, depending on exercise volume. Basically, if you’re peeing clear by lunch time you’re pretty well hydrated. Don’t be tempted to skip this step because it sounds a bit dull and boring. Dehydration can affect your lifting in the gym, so if you want to keep knocking out those PBs, you better make sure you’re getting your H2O on a daily basis. Ok. You’re now eating whole foods and drinking plenty of water. Now’s the time to take your nutrition up a notch and get into a bit of the maths. This is the fundamental principle for achieving your fitness goal from a nutrition standpoint. Again, I could go into finer details and and scientific studies, but at the top level maintaining the right energy balance is going to be a key point for your success. Understanding where you are and where you need to be on a daily basis with regard to ‘Calories In vs. Calories Out’ is critically important and I can’t stress that enough. The basic principle is that if you consume more calories than your body uses up, you’ll gain weight. And if you consume less calories than your body burns, you lose weight. That’s a gross over-simplification, but it serves the purpose for the point I’m trying to make here. How do you get your energy balance right? There’s a couple of ways to do this, but something called the Katch-McArdle method is the one I find to be most accurate. You’ll need to know your current body weight, estimated body fat percentage to get what I like to call your ‘Coach Potato Calories’ (or Basal Metabolic Rate – BMR for the people that want the correct term). This is the amount of calories you need to consume every day to stay at your current weight if your plan was to sit at home and do nothing in the form of exercise. If you’re unsure how to estimate your body fat, you can do a Google search for ‘Body Fat Comparison Chart’ and pic and corresponding % that most applies to you. And be honest! Don’t kid yourself that you’re 4% body fat! Now you have your TDEE (or Total Daily Energy Expenditure). In real people speak, that means the amount of calories you need to maintain your current weight. If you’re aim is to cut weight, minus 20% off this number. And if your plan is to bulk, add 10%. Macros aren’t just that function in Excel that no-one understands (at least not me anyway). They’re really just posh terms for protein, carbs, and fat. The reason why macros are important are because they relate directly to achieving the right body composition. In your head you’re goal is to lose weight, but I translate that to losing body fat. I’ve not yet met a single person that yearns for weight loss, but wants to maintain fat! That’s my macros are so important. A high protein diet is going to help preserve muscle when you are shedding body fat and it’s going to give your muscles the nutrients the need to grow if you’re planning on bulking up. It’s important to know at this stage that protein and carbs have around 4 calories per gram and fats have around 9 calories per gram. Clean Eating – Eating wholesome and nutritious foods, removing processed and refine foods from the diet. Basically, eat what you want as long as it fits that definition. Neither of these approaches work for me in isolation. My method blends the two together for a much more rounded diet. In step 5, we lean towards the clean eating so that you’re getting all the micro-nutrients you need within your daily nutrition. Micro-nutrients are all those essential vitamins and minerals you need to make your body work like the well-oiled machine it’s supposed to be. Similarly to your water intake, calculating micro-nutrient intake is considered by most people to be a bit of a ball-ache and generally something that’s avoided. And to be honest, unless you’re looking at real marginal gains it’s not worth it. The best tactic is to make sure you’re getting at least 5 portions of fresh fruit and vegetables every day. Keep varying these day to and you’ll naturally get a good blend of those vitamins and minerals. Another pitfall a lot of people fall into is trying to change everything in their lives to work around the meal plan they’ve just created. This just isn’t practical and not how life works. Life has a knack of getting in the way. Things will crop up and you need to be flexible to get around them. The best advice I can give is to not really worry about meal timing at all. Eating every 2-3 hours like a new born baby isn’t essential to success. If you find you can stick to your plan better if you just have 3 main meals, then do that. Do what works for you as an individual. That’s your route to success! The only meals that are worth paying particular consideration to are your pre and post workout meals. A bit of protein and carbs before and after your training sessions is definitely beneficial. Everything else sits in the bracket of minutia that you don’t really need to let bother you (unless your in the ‘advanced’ category and looking for those extra gains). There’s a reason why supplements are last on the list. They’re the least important thing in your diet. It might be a lot of people’s first though, even yours, to start scrambling around online for the supplements that are going to be the secret success and results. Reality check here is that success isn’t going to lie in a bottle BCAAs or in a tub of protein powder. It boils down to hard work and consistent dedication to the previous 6 steps I’ve just walked you through. Sure, there are some supplements that will be beneficial in helping you achieve your goals, but they won’t do a single thing for you if everything isn’t set up right. If you’ve followed everything to the letter so far then I’d recommend a good whey protein isolate, creatine, fish oil, and vitamin D as your base level supplements, with a consideration to others depending on your goal. There really isn’t much more to be said on this one. The miracle pill or powder you seek just doesn’t exist.